Smet-Boring nv handles all administration for the Smet Group and has its own construction workshop. Smet-F&C nv (Foundation- & Consolidation Techniques) is a specialised foundation company that provides solutions to your foundation or construction pit problem. Smet GWT Europe nv is a specialised vertical drilling, dewatering and water treatment company. 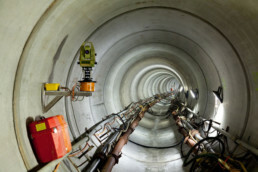 Smet-Tunneling is a leading tunnelling company with European references. The Smet Group is a family business with about 450 employees that has specialised in underground techniques since 1900. The 6 subsidiaries of the Smet Group are leaders in a variety of market segments such as dewatering, vertical borings, water treatment (electro-mechanics), soil energy, micro tunnelling, tunnel borings with segments, sewage rehabilitation and numerous foundation and consolidation techniques. The Smet Group have their own workshop for the construction and maintenance of machinery. Many years of experience, both domestically and abroad, make Smet an excellent partner in underground techniques. Work for Smet Group? Our vacancies at Smet Group are only published on the Dutch part of our website.